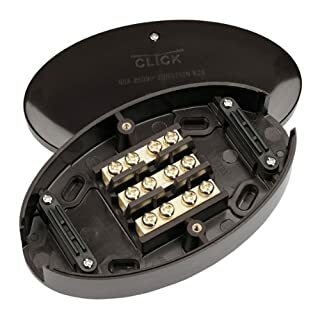 60 Amp Junction Box. 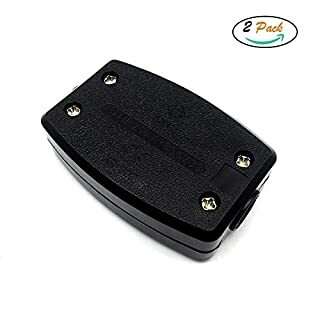 250Volt. 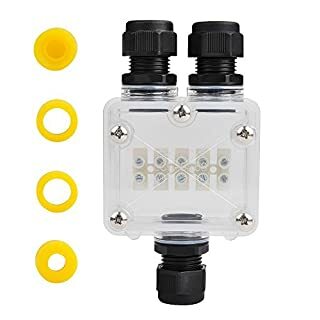 This junction box accommodates 6mm cooker cable and 6 & 10mm shower cable Comes with inlet and outlet cable grip clamps Overall size 150mm long. 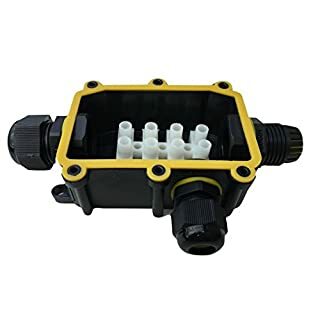 The brass part can accommodate conductors up to 7.5mm in diameter (don't mix up diameter with area, cable is measured in cross section area) . 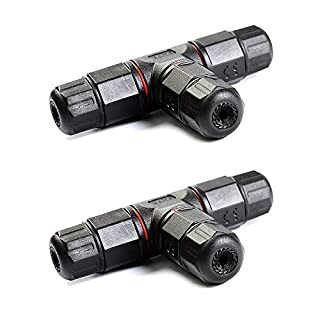 IP 68 top Waterproof 3 Way Cable Connectors for cables with diameters 5.5mm-10.2mm Technical specifications: Material: PP plastic Color: Black Mating connector: 3 x PG11 For the wires with a diameter of 5.5-10.2mm Clamping range: 4 Square Supply voltage: 17.5A / 230V Waterproof: IP68 Dimensions: 115 x 95 x 50mm 1. 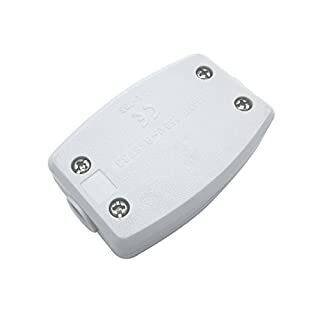 Suitable for LED billboards, LED tunnel lights, LED Road landscape lighting, LED outdoor display, LED garden lights, garden spike light and so on. 2. 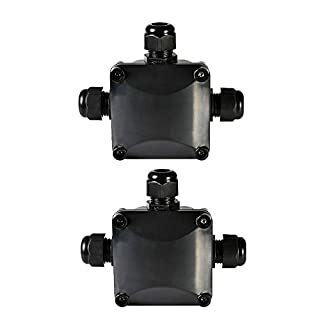 Further applications in coastal, river, sea or underwater engineering, underground engineering, mining engineering, solar-wind power, solar water heaters, various machinery and equipment. IMPORTANT: To ensure a lasting seal, we refer to the following: - 1. Use appropriate tools to avoid damaging the material of the article - 2. 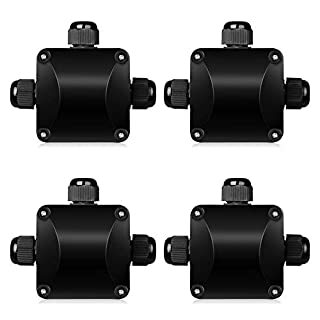 Please use the correct seals for the cable diameters for the cable entries - 3. In addition, we strongly recommend against penetrating moisture to grease all seals! This additionally facilitates, inter alia, Also the introduction of the cables (coats) - 4. After the ladder is secured and before final storage, please check ALL the screw connections and tighten them if necessary. SATISFACTION GUARANTEED:12 Months Warranty: 100% Money Back Guarantee if you are not satisfied with the purchase. Please feel free to contact us if there are anything we can do for you. 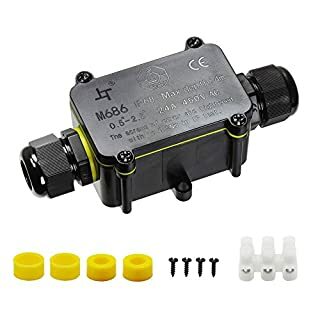 3 Terminal connector is 2 pcs in the box, that is include fire-wire null-line earth-wire terminals.Rating 13Amp 250v small size 64mm(L)*41.5mm(W)* 17.8mm(H). 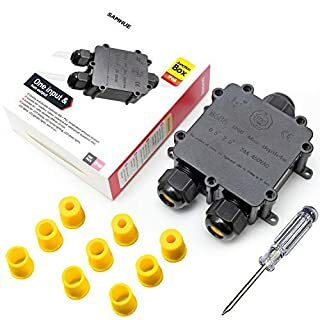 The connection with the wires looks very coordinated and there has one install instruction in the box inner.When you open the box, you will see it, it's made from a tough durable rubber/plastic material so shouldn't break easily.Doesn't feel like it will crack if accidentally dropped or stepped on, save expensive maintenance work.Easy to connect both ends wires together, excellent cable grips to secure the entry and exit cables and a strong robust terminal block to anchor the wires to. 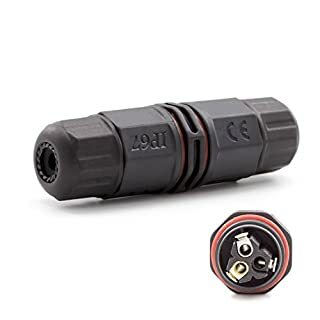 As long as the grips are tightened correctly the cable is almost as strong as if there were no connector block at all. 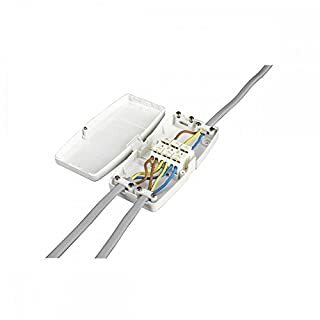 It is much safer and easier to use a junction box like this to join mains cables, instead of electrical tape. 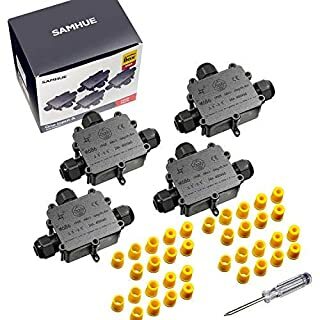 Widely used in lighting, power and automotive wiring, Suitable for motor, electrical control, power, household appliances, lighting, machinery and wire joints. 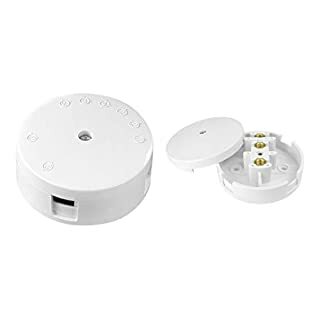 Features: 1.Good for the place where to need waterproof joint,such as: LED equipment, grating, external wiring,factory automation control, wireless bridge and so on. 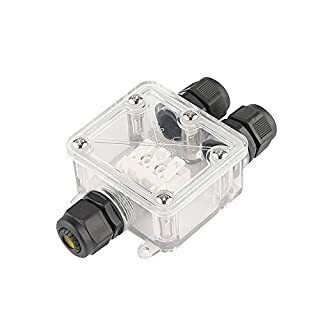 2.Tidy design and easy to install, moisture-proof and dust-proof, safe and reliable, great little junction box wiring can seal the cable well,DIY tools.Specifications: Voltages: 250V Rated Current: 12A--16A Waterproof Ring: Silicone Color:Black Protection Class: IP67 Waterproof Relative Humidity: ≤90% Contact Resistance: ≤ 10mΩ Maximum Diameter of Entry: Φ10mm Materials: Inflaming retarding/Anti UV nylon What you get: 1x junction box Brand Introduction: ANSCHE provides reliable after-sales service, your satisfaction is our highest requirement. Please don't hesitate to contact us, if you have any questions. We will respond as soon as possible. 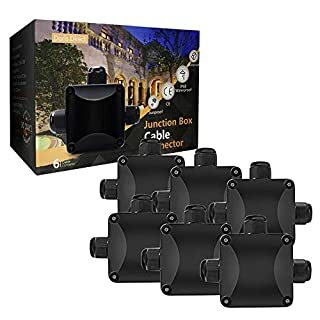 product description: -High quality nylon plastics material, waterproof, durable, anti-aging and dust-proof. 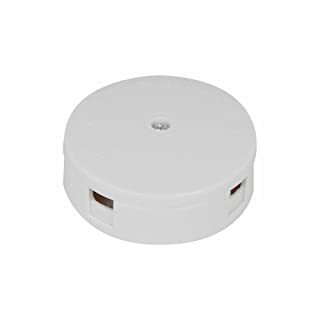 -It is capable of accommodating 2 and 3 conductors in round or flat profile cable specification: Material: Plastic. 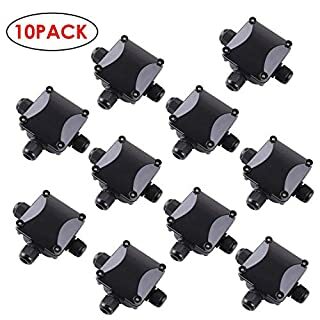 Size: 64mm x 41.5mm x 18mm/2.52inch x 1.63inch x 0.71inch Color: black Package includes: 2 x Junction Box Note: -If for any reason you`re dissatisfied, we guarantee 100% refunds. 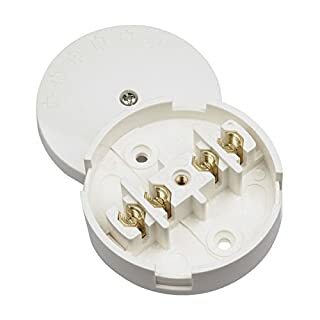 30 Amp 3 Terminal Junction Box White Features The ESB008 from PIFCO is a 75mm (Diameter) 30 Amp junction box connection unit which features 3x 2.5mm² connections and 4 cable entries. 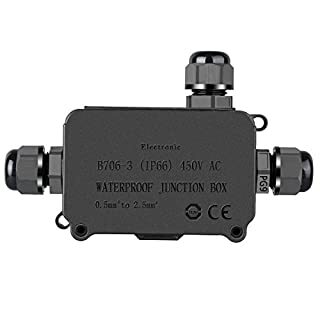 3 WAY JUNCTION BOX WATERPROOF OUTDOOR JUNCTION BOX IP68 Waterproof -Up to 4 metre depth in water for Max 72 Hours Perfect to extend electric devices, LED lighing, CCTV, outdoor lamps and lanterns Suitable for wire thickness: 5-9mm diameter.